AIBE (13) 2019: All India Bar Examination is also known as AIBE Exam. It is a National level Law Entrance Exam which provides “Certificate of Practice” in the field of law. Bar Council of India (BCI) is the conducting body of this Entrance exam. The AIBE XIII Exam will be conducted in the month of December. AIBE Exam is an Offline Exam. The Most Interesting thing about this exam is that the AIBE 13 2019 Exam is being conducted to test the ability of advocates who want to practice the legal profession in India. Latest Update: AIBE (13) Registration Started. Check the procedure below !! Latest Update: AIBE 13 2019 Complete Schedule Announced !! In this Article we are providing all the information about the AIBE (13) Entrance exam, AIBE (13) Application Form, Exam Dates, and other details. The tentative schedule is given below, candidates need to be ready and careful about the events if you are interested in. So here is the AIBE Exam 13 Important Date. 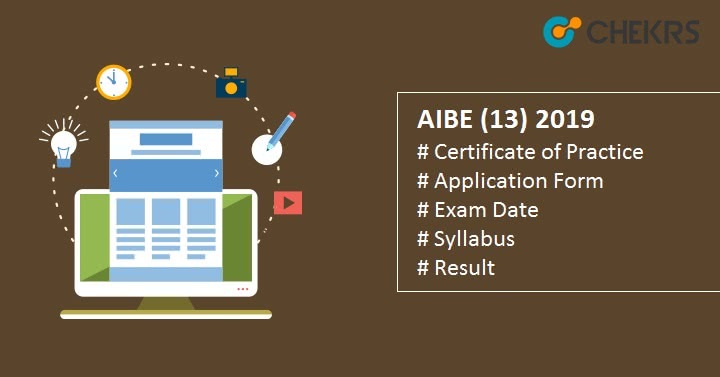 There are some AIBE 2019 Eligibility Criteria predefined by the conducting body, and candidates have to fulfill all of them before filling the application form. Candidate must hold Indian nationality. Must be qualified 3/5 years LLB degree from any recognized university. Candidates must be enrolled with their respective State Bar Council. There will be no age limit to appear in the AIBE 13 2019. The Authority will release the AIBE Application Form in the month of May. It will be available through the online mode on the official website. Candidates have to upload all the required document like category certificate, ID proof, and enrolment certificate along with photograph and signature. First of all candidates have to Visit the official website and generate login id and password, you will also need to enter some very basic details in this form. After it, Login using the same login id and password. Now access the application form and fill all the Personal, Academic and Contact details there. Also Upload All the required documents on the prescribed area. Now Pay the Fee and Take a printout of Receipt and filled application form. Interested candidates can pay the AIBE 2019 Registration fee via SBI challan only. AIBE (13) Application Fee will be Rs 3560/- for general/OBC candidates. Fee will be Rs 2560/- for candidates belonging to SC/ST category. How many times AIBE is conducted in a year? The AIBE Exam is being Conductet Annualy, It means Once a year. The Exam Normally Organized in the month of December. How to get AIBE certificate? Candidates Need to fullfil the Eligiblity Criteria, than fill the form> Do Preparation and Qualify the Exam. This is the only way to get the AIBE Certificate. When the next AIBE exam will be held? The AIBE Exam normaly conducts in the December month of every Year, Thus the Next AIBE Exam, AIBE (13) 2019 will be conducted on 23rd December 2018. Check the Exam dates for more info. .
Why to give/Appear in AIBE Exam? AIBE Exam is being conducted to test the ability of advocates who want to practice the legal profession in India. It also provides “Certificate of Practice” to Qualified Candidates in the field of law. Which is Very Important Certificate. AIBE 13 Exam will be conducted through offline mode, means Pen-and-Paper based. There will be no negative marks for wrong answers. Other AIBE 13 Exam Pattern are given in the table below. Marking Scheme Each question will carry 1 marks and there will be no negative marking. The AIBE Syllabus will be provided by the authority through Official Notification. Candidates are advised to follow that syllabus. Basic topics and number of question from that topic are listed below. Answer Key will be released on the official website in the next few days after the exam. Candidates can estimate their marks through AIBE XIII Answer Key. To download the Answer key candidates needs to go to the official website and find the link for the Answer Key. And then they can download the AIBE Exam Answer Key. The result will be probably released in the month of July / August 2019. The result can be accessed after login to the site. There will be no marks or percentile in the AIBE 13 Result it will only show you are qualified or not-qualified in the exam. The result can be accessed after entering Roll number and DOB on the result page. If the candidate forgets the login details they can use “Find Your Roll No.” option.